In September 2008 the Special Agency of the International Fair of Sardinia solicited an ideas competition for the re-qualification of the neighborhood of the International Fair of Sardinia. XCOOP envisioned a strategic intervention which gives back to Cagliari an important connection to the waterfront. The objective of the competition is to welcome ideas and design hypothesis aimed at bringing value to the Fair neighborhood through a rational distribution of spaces and volumes which allows the area to be utilized as a fairground, a venue for congressional activity and as a support to the City of Cagliari and to the Region of Sardinia for large artistic and sport events. While analyzing the vast context of Cagliari and, more specifically, its position on the Mediterranean sea, in Italy and in Sardinia as an island it is easy to recognize how the identity of the city is, at spots, not well defined. In particular, there is a missed opportunity in how the district of Sant'Elia and the Fair itself relates within the context of the city of Cagliari. Currently, they lack a seamless integration into the rich natural and urban fabric in which they are immersed . XCOOP believes that, in order to sustain a city and before encouraging new projects, it is necessary to make smart use of what already exists. 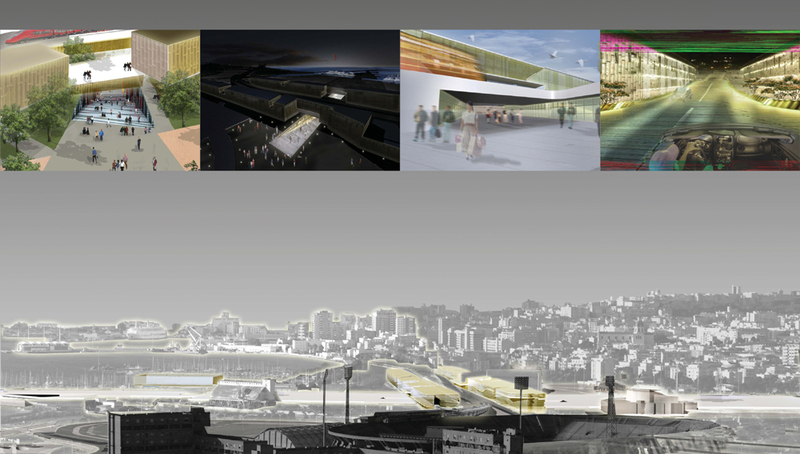 With the idea of the new Fair, XCOOP envisions a strategic intervention which gives back to Cagliari an important connection to the waterfront, invigorates an under-developed urban area, reinforces the existing infrastructure assigning to it an urban character and makes one of the most beautiful areas of the city accessible to many.